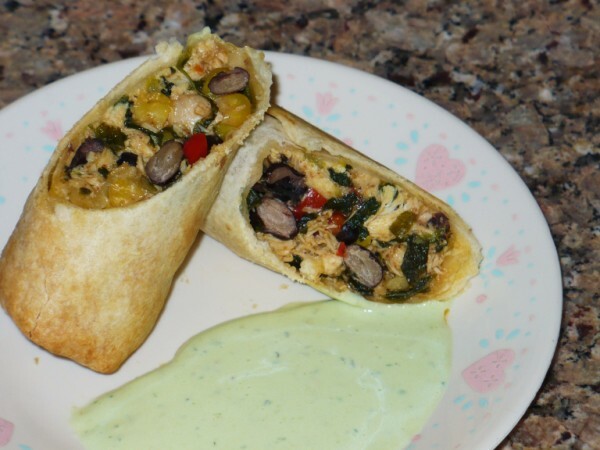 These are a baked (and therefore healthier) version of Chili's Southwestern Eggrolls. I looooove these things! The dipping sauce is the best and totally makes this dish. These are a little time consuming, so I've adjusted the recipe to make about 15 rolls so you're not wasting your time. You can always freeze some of the rolls before baking to have on hand at a later date. Just thaw them out, brush with butter, and bake as usual. The dipping sauce does not freeze well, however, so that will have to be made fresh. Any leftover sauce would make a great salad dressing. Regarding the frozen chopped spinach: once it thaws and you squeeze all the liquid out you end up with a lot less volume. So about 1 cup of frozen spinach breaks down to about 1/2 cup thawed. Preheat vegetable oil in a large skillet or saute pan over med-high heat. Add the red pepper and onion and saute for a couple of minutes until tender. Add the chicken, corn, black beans, spinach, chilies, cilantro, cumin, chili powder, salt, cayenne (if using), and liquid smoke (if using). Cook for another 4-5 minutes, stirring well so that the spinach separates and is incorporated into the mixture. Remove the pan from the heat and add the cheese; stir until cheese is melted. Preheat oven to 375 degrees. Spray a 9x13 baking dish (AND an 8x8 baking dish if you are baking all 15 rolls) with cooking spray. 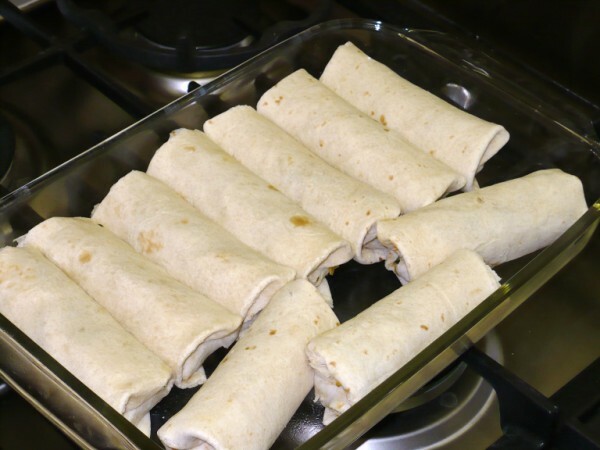 Wrap the tortillas in a moist cloth or paper towel and microwave until warm, about 1 - 1 1/2 minutes on high. Spoon about 1/3 - 1/2 cup filling into each tortilla and roll it up, tucking in the ends as you roll. Place each one seam side down in a baking dish (you can fit 10 - 11 in the 9x13 and any remaining in the 8x8). Brush with butter and bake for 30-35 minutes or until golden brown on the edges. To serve, cut in half on a diagonal and serve with dipping sauce. Combine all ingredients in a bowl and mix well. Keep refrigerated until use. Sauce will thin as it stands.